For the sake of Russell Westbrook and Kevin Durant’s future health. The Thunder are currently 3-6 this season, and their schedule is relatively light for the next month, but they look really bad right now. Coach Scotty Brooks is running Reggie Jackson into the ground by playing him 42 minutes a night, knowing it’s their only chance of squeaking out some wins. The Thunder can definitely make the playoffs, but is it worth making a championship run this year? Maybe not. First, consider Westbrook’s recent injury woes. It all started in the first round of the 2013 Playoffs when Patrick Beverley ran into Westbrook’s knee as he was calling a timeout. Russell needed two surgeries to repair his torn meniscus and was expected to miss at least the first few weeks of the 2013-2014 season, but surprised everyone by suiting up just three games in. For the first few months, the early return didn’t seem like a problem. Russ was back to being the most fearless player on the court, constantly going 100 mph. But after a triple-double performance on Christmas Day, it was announced that Westbrook would have to undergo a third operation on his knee. Russell played the rest of the regular season on a minutes restriction and sat out the second game of any back-to-backs. But a monstrous postseason would once again put all injury doubts aside. All signs pointed toward Westbrook opening the upcoming season in dominant fashion. And he did… until the Thunder’s third game. With Westbrook’s latest injury, you have to start questioning how ready his body is. In the last 19 months, Westbrook has undergone three operations on his knee and one on his hand, only suiting up for 67 of their last 110 games. It’s important to note Westbrook didn’t miss a game in his entire life before the Beverley incident. It seems like rushing back from surgery last season may have led to even more injuries. I think Russell could really benefit from taking some extra time off, even when his hand recovers. He goes harder than anyone in the league, constantly putting himself at risk of getting injured. The Thunder should really consider giving him some extra time off to avoid further damage. Likewise, Kevin Durant should learn from Westbrook’s recent struggle to stay healthy and really make sure he’s 100% before he comes back. KD doesn’t take quite the same beating Westbrook does on a nightly basis due to his unstoppable jumper. However, he does work just as hard as Westbrook, and with a 6’11” lanky frame, he should take the stress fracture in his foot seriously. Durant is obviously aware of injury risks, as he pulled out of Team USA to rest his body. But he also said he worked harder than ever to win a championship this upcoming season. We know how devastating foot injuries can be, especially for taller players, so Durant should think about taking a step back while he recovers. Russ and KD are young and have long careers ahead of them. Taking a full season off is almost unheard of, but in this case, it could be worth it. But we haven’t even discussed the biggest advantage of resting Durant and Westbrook: a top draft pick. We all know what GM Sam Presti can do in the draft, and a prized rookie couldn’t come at a more perfect time. With Westbrook, Durant, and Ibaka locked into big deals, the financially-strapped Thunder are going to have a tough time resigning Reggie Jackson this offseason. He is clearly a huge part of the team’s success, but he may demand too much money, much like James Harden. If the Thunder are able to resign Jackson, they’re going to have to find some players that can contribute without killing their salary cap. The best place to find these types of players? The NBA draft. To be in the hunt for the coveted first overall pick, the Thunder definitely don’t need to go for the worst record. The team with the worst record has only won the lottery three times in its 23 year history. If the Thunder were able to get a top three pick and draft a center like Jahlil Okafor or Karl Towns, tanking could be worth it. Having three bigs like Ibaka, Okafor, and Adams alongside KD and Westbrook would be devastating. I don’t see the Thunder winning it all this year, so why not go for the dynasty? Mark Cuban’s suggestion seems cute on the surface, but the Thunder face a completely different situation than the 1996-97 Spurs. Let’s start with the obvious. The Spurs didn’t have the option of choosing whether to play or sit David Robinson, as he needed surgery to insert a screw in his left foot. This type of injury is very serious for any athlete, let alone a seven-footer. Just ask Yao Ming, Brook Lopez, or Zydrunas Ilgauskas. Sitting out the year is mandatory, especially for a 31-year old center who had carried his franchise for the past seven years. 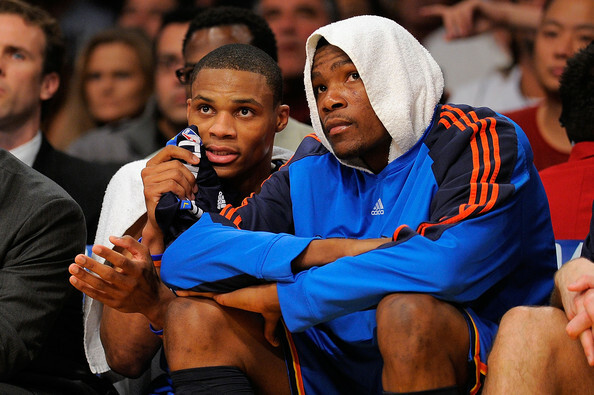 On the other hand, superstars Kevin Durant and Russell Westbrook are expected to return in about a month. Both are only 26-years old and have just entered the peaks of their basketball careers. There is absolutely no way either would agree to sit on the bench and watch their team lose while healthy. A basketball career is short in the grand scheme of things, and I’m positive Durant and Westbrook will try to play as much as they possibly can. Durant will want a crack at defending his MVP title, no matter how slim his chances are, as well as another shot at his first championship. Plus, he becomes a free agent in two summers, and the Thunder will do everything to keep him as happy as possible. If OKC’s management sits him out the whole year, they risk destroying their relationship with him. Similarly, Westbrook, one of the league’s premiere guards, is the fiercest competitor in the game and will play as soon as possible. The guy wants to win so badly that when he gets injured, he doesn’t feel pain; he just gets angry. Westbrook seemingly forgot about his broken hand when he got into it with a Clippers fan a couple weeks ago. I sure wouldn’t want to be the one to tell Russ he’s done for the year. Furthermore, tanking guarantees absolutely nothing. The Spurs were extremely fortunate to win the lottery considering they didn’t even have the league’s worst record (the Celtics and Grizzlies finished with worse records). But they were even luckier to have won the lottery in a year where a transcendent player like Tim Duncan was available in the draft. Rather than following the path of the 1996-97 Spurs, the OKC Thunder should strive to be like the Spurs of the 2000s. So far, GM Sam Presti has done an incredible job. He drafted KD (2nd), Russ (4th), Serge Ibaka (24th), and James Harden (3rd) in a three-year span. The Thunder have since found great value in Reggie Jackson (24th), Perry Jones (28th), and Steven Adams (12th). But the Thunder have a long way to go, as the Spurs were able to find hidden gems late in the first and second rounds for a full decade (which is what you have to do when you're constantly finishing with one of the league's best records). If there is one thing the Thunder can take away from the San Antonio model, it’s that foreigners are worth gambling on. Of the ten players listed above, seven came from outside of the U.S. And I don’t think I have to tell you that two of those seven were Tony Parker and Manu Ginobili. Wake up Cuban, and quit dreaming. The Thunder aren't tanking, and the Mavs may well have to face them in the playoffs.